Having just come in from the farm, peeled off several layers of clothes including waterproofs, hat, gloves and body warmer and plunged my hands in to tepid water (which felt like boiling) my hands have come alive enough to type. 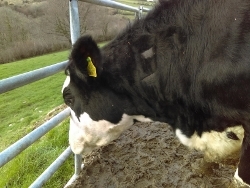 We have just completed our TB readings. TB tests are a gut-wrenching job that all cattle farmers have to do. The first day is injection day with the vet identifying each animal, shaving the injection site, measuring the skin in each of the 2 sites and then injecting them with 2 different solutions under the skin. The stress for the animals, especially the older cows who know what’s coming is hard to watch and can make them difficult to handle. Then the awful wait of 3 days before the vet visits again. This time he just needs to measure the skin on the injection sites to see if there is a reaction ie a lump. With each animal your heart is in your mouth wondering if this animal is destined to be slaughtered before her time because of a high TB skin reading. At the end of our test this year we are clear. It leaves you with a bitter sweet feeling – yippee we are clear for another year but oh lord we will have to go through this all again in a year or sooner if one of our farming neighbours “goes down” with TB. Time for a very hot cup of tea and let the nervous energy of the morning dissipate.